O.K. thanks I wasn't for sure on these type wheels. FOR SALE Selling my fleet of 15 Mack coal trucks. Those trucks are still for sale I just seen them on Craigslist in the Lexington Ky area. 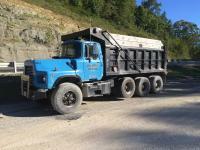 FOR SALE 1996 Mack DM688S SOLD!!!!!!!!!!!!!!!!!! O. K. thanks for the help I got one I can buy off a 711 but wanted to make sure it would work first.